My iPhone homescreen as of September 2015. This post orignally appeared in the MacStories newsletter (now Club MacStories). I like to try and keep all of my apps on one page, hence the large number of folders. In the fight between quick access to apps and tidiness, tidiness always wins. Having said that, I do still like to keep my most used apps one tap away. 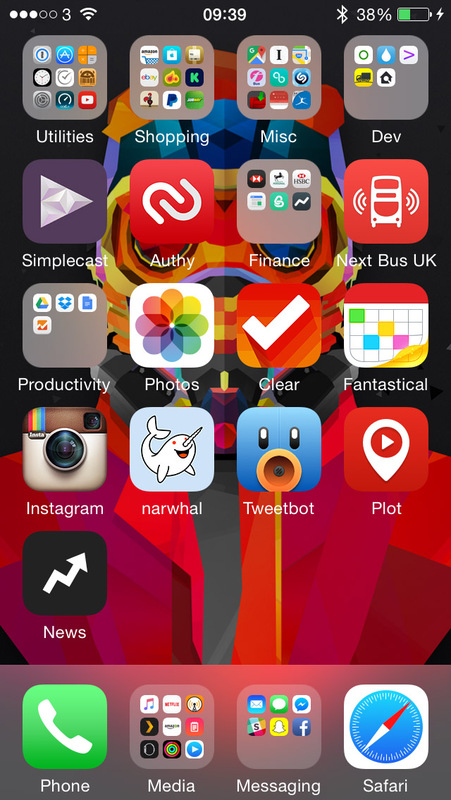 The empty bottom row is used primarly for apps that I’m trying out which, at the moment, happens to be BuzzFeed News. Because I only have one screen of apps, my dock is less important than if I had multiple pages. I have always kept phone and Safari in those spots and as I’ve added more messaging apps (Facebook, Slack, Snapchat) the Messages app has been replaced by a folder to contain them all. Similarly, because I switch between listening to podcasts in Overcast and music, all media-related apps go into the media folder in the dock. The app I use the most is definitely Tweetbot; I spend a lot of time on Twitter so I need to be able to get to it quickly. I also regulary catch on a number of subreddits and Narwhal is easily the best Reddit client I’ve found as the official one is far too confusing. Clear and Fantastical are the best apps in their respective categories and I wouldn’t even considering removing them from the home screen. Although I don’t use it as much as Tweetbot or Narwhal, Plot is a fantastic app for keeping track of movies I want to watch and ones that I have watched. Simplecast is a saved web site and not a native application, but I like to check up on the download numbers for my podcast so that earns a spot on my home screen. Some of the other apps that are hidden away that I use regularly include Due, a simple but really powerful reminders app, Blink for generating iTunes affiliate links and Deliveries for tracking parcels. The background is a Star-Lord wallpaper (that I also use on my desktop) and you can download it here.